Adult Unhealthy Days is a new measure on SHADAC’s State Health Compare that provides state-level estimates of the average number of days in the past 30 days that an adult’s mental or physical health was not good. The measure is available as a combination of physically and mentally unhealthy days and separately for physically unhealthy days and mentally unhealthy days. The measure is available for 2011 through 2017 and is produced using the Behavioral Risk Factor Surveillance System (BRFSS). * See notes section for why physically and mentally unhealthy days do not add up to the composite measure. 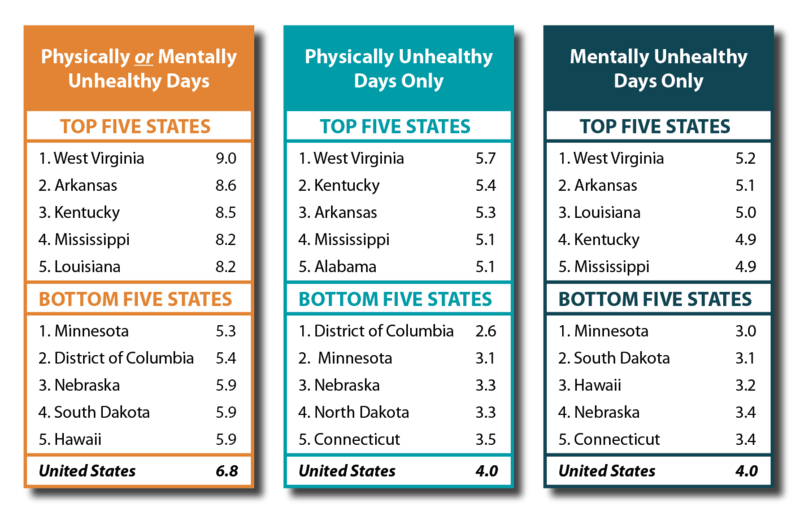 Exhibit 1 presents the top five and bottom five states for the average number of unhealthy days in 2017 by type of unhealthy days (physically or mentally unhealthy days; physically unhealthy days; and mentally unhealthy days). West Virginia has the highest average number of unhealthy days for each type of unhealthy day at 9.0, 5.7, and 5.2 days respectively. Minnesota has the lowest average number of physically or mentally unhealthy days at 5.3 days and the lowest average number of mentally unhealthy days at 3.0, while the District of Columbia has the lowest average number of physically unhealthy days at 2.6 days. The new age breakdown, in particular, is useful when making comparisons between states, since differences in the size of a state’s elderly or young adult populations may drive observed differences in healthy and unhealthy days: When considering all ages together, states with proportionately larger elderly populations may exhibit more unhealthy days than state with proportionally smaller elderly populations, and vice versa for young adult populations. Comparing states across age breakdowns provides a more apples-to-apples view of inter-state differences and similarities. 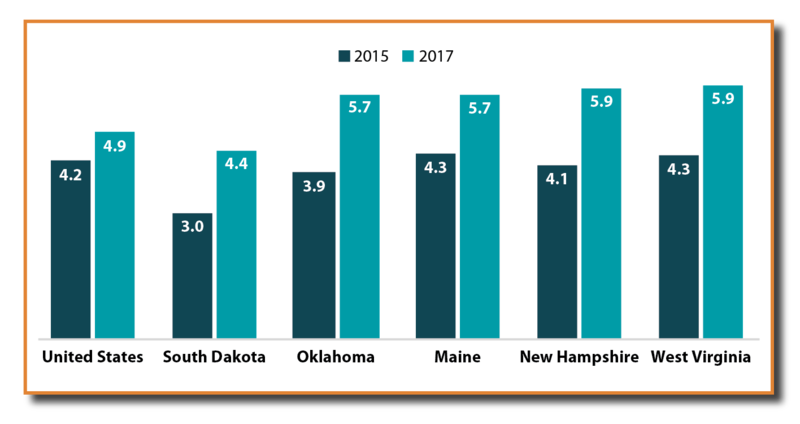 Exhibit 2 shows the five states with the largest significant increases between 2015 and 2017 in mentally unhealthy days among those ages 18–34. Between 2015 and 2017, twenty-six states had statistically significant increases in the average number of mentally unhealthy days among those ages 18–34 (no states had significant decreases). *All changes shown are significant at the 95% level. Adult Unhealthy Days is a composite measure of physically unhealthy days and mentally unhealthy days. For each adult BRFSS respondent, the number of physically unhealthy days reported in the last 30 days is added to the number of mentally unhealthy days reported in the last 30 days. These numbers are then averaged across all individuals in each state. However, the composite measure is censored at 30 days. As a result, the composite measure is in some cases smaller than the actual sum of the average number of mentally unhealthy days and the average number of physically unhealthy days. For example, if an adult reported 17 mentally unhealthy days and 20 physically unhealthy days, this individual would be assigned the maximum of 30 physically or mentally unhealthy days. Please see the CDC document Measuring Healthy Days for more detail on methodology and validation and the 2017 BRFSS questionnaire for exact question wording. The estimates presented in this post are for the civilian non-institutionalized population 18 years and over. All data in this post come from SHADAC’s analysis of the BRFSS public use files and can be found at statehealthcompare.shadac.org.